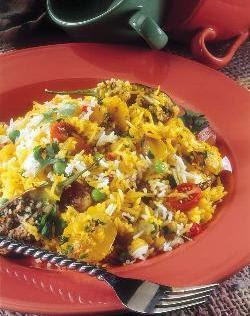 Khichdi is commonly served with an Indian Dish called Kadhi. Other common accompaniments are papads, beguni (Deep fried eggplants in a besan batter), ghee (Clarified butter), pickle and Yogurt. I took my inspiration with this and created my own version of Stuffed Vegetable Khichdi. Basically I did a fusion of two Gujarati Dishes, Sambhariyu and Khichdi. Stuffed Vegetable Khichdi is a tasty and nutritious meal in itself, easy to cook too! Easiest part of this recipe is, you just need to dump all the ingredients into the pressure cooker, and wait for a magical delicious dish to serve hot with Ghee!hearts and spread sweetness! 1. Make criss-cross slits on the onions, potatoes and brinjals taking care not to separate the segments (you can use vegetables you like, be innovative dont restrict yourself with these three veggies). 2. Stuff each of the onions, potatoes and brinjals evenly using the prepared masala mixture. Keep aside. 3. Heat 2 tbsp of ghee in a pressure cooker, add the asafoetida, rice, toovar dal and turmeric powder, mix gently and saute on a medium flame for a minute. 4. Add stuffed vegetables, green peas, salt and 2 1/2 cups of hot water, mix gently and pressure cook on a high flame for 3 whistles. 5. Allow the steam to escape using natural release method, (refer tips) before opening the lid. 6. Add the remaining 1 tbsp of ghee, mix well and serve immediately. 1. Natural release method: to use this method, remove the pressure cooker from the hot burner and let the pressure drop by cooling down naturally. 2. It works best for grains and for beans that you might use for salads, as quick-releasing the pressure can cause the beans to split apart. I have visited your Blog and we really liked it - great recipes YUM YUM. I would like to add it to the naiya-recipes.com. and benefit from their exposure on Naiya’s Recipes. To add your site to the “ Naiya’s Recipes” family you can use http://naiya-recipes.com/index.php?option=com_jvle&Itemid=76&task=addbanner or just go to naiya-recipes.com and click on "Add your FoodBlog or Site"